284 p., 14,7 x 20,8 cm. In cooperation with Wolfgang Berner, Kurt R. Eissler, Piet Kuiper, M. Egle Laufer, Paul Parin, W. Solms and Léon Wurmser. With contributions by Randolf Alnæs, Wolfgang Berner, Georg Bruns, Ernst Federn, Claudia Frank, Sigmund Freud, Klaus Hoffmann, Ulrike May-Tolzmann, Marion M. Oliner and Michael Schröter. Much of current psychoanalytic thinking reflects a confusion concerning the proper place for external reality. It is absent from the theories of the hermaneuticists and it is excessively present in the group that is influenced by seif psychology. Those interested in the study of trauma tend to believe that the classical analytic approach is not in order when it comes to patients who have suffered ›real‹ trauma leading to the unacceptable Separation of individuals into two separate categories: those who have suffered real trauma and those who are neurotic. It is my firm belief that a review of the role of external reality in psychic functioning is overdue, and the present work is an attempt to reassess the State of our knowledge of the impact of this important dimension. Not to give external reality its proper place leaves psychoanalysis open to unwarranted accusations regarding its supposed ignoring the difference between actual events and imagined ones; and it is contrary to psychoanalytic tradition, grounded as it is in the material reality of the body and the reality of fate. The author denominates identification and detachment as two main issues of the psychoanalytical attitude. He shows that both principles were exercised in psychoanalysis from the beginning by Freud, though in his publications he took the view that psychoanalysts should be detached from their working like scientists. The author points out the opinion that the principle of identification first came into play in Freud’s description of anxiety neurosis, but unnoticed by Freud himself. The Fließ-Letters show that Freud simultaneously with his scientific exploration of the anxiety neurosis suffered from a cardiac neurosis with just the same Symptoms he found in his patients. Hence it seems plausible to assume that Freud’s exploration of the anxiety neurosis was a presumably unconscious experiment of selftreatment. Nowadays the psychoanalytical principle of identification is used manifold and intentionally; it has extended the range of psychoanalytical knowledge. The discovery of the unconscious by Freud was soon applied to other areas of life. Freud himself and Ferenczi did so in 1908 in the fields of social life and education. In the Minutes of the Vienna Psychoanalytic Society, 1906-18 can this development be clearly observed. By Ernest Jones 36 papers on application of psychoanalysis were published. The psychoanalytic theory underwent various changes and its history is briefly described. Although the scientific character of psychoanalysis ist still being questioned because its contents cannot be proven objectively it had tremendously expanded and is being applied to all areas of life. The term «Zwangsneurose» (obsessional neurosis) goes back to Freud. He introduced it in 1895 for a clinical picture which was already known by names as «Zwangsvorstellungskrankheit» (obsessional illness). According to the prevailing theory of the time obsessional Symptoms were ultimately of somatic origin. They could be seen as a separate nosological entity (Westphal) or as aspects of other illnesses, above all of neurasthenia (Krafft-Ebing). It was impossible to include them among the neuroses as the latter had by definition somatic Symptoms (and causes). Contrary to that Freud claimed in his paper «Obsessions and phobies» (1895) that there are obsessional Symptoms which are mental in origin, i. e. determined by warding-off conflictual sexual ideas, and can therefore be treated psychotherapeutically. He proposed to detach them from neurasthenia which had no mental cause and resisted psychotherapy, and to regard them as a seperate nosological entity (in WestphaPs sense). That Freud described this illness as «neurosis» corresponded to the «modern» concept of neurosis which was just beginning to assert itself at that time. This may explain why his term «Zwangsneurose» was late (probably 1915) in gaining entry into official teaching. Freud presented his views in 1895 at the Vienna «Verein für Psychiatrie und Neurologie», whose chairman was Krafft-Ebing. It seems that his colleagues’ objections were not primarily directed against sexuality as an etiological factor but rather against his upgrading sexuality from an occasional to the cause, his claiming general validity of his theory and his adopting the «modern» concept of neurosis. «Obsessions et phobies», the original of the text reprinted here for the first time, belongs to the phase 1894-1896, in which Freud was attempting to develop a new comprehensive theory of neuroses. At the time he involved himself not only by writing but also socially in the broader neuropathological discussion, including appearances at the respective Vienna specialist association. His first paper there dealt with «Obsessions and Phobies», provoking the president of the association, professor Krafft-Ebing, into Opposition. Eager to gain publicity, in 1894 Freud entered on a connection with the Wiener klinische Rundschau, which had been edited by A. Schnitzler and was just being reorganized. Freud evidently took part in the translation of «Obsessions et phobies», which appeared in the Rundschau and for which an acquaintance of his, A. Schiff, was officially responsible. Early in the thirties Norwegian psychiatrists and psychologists went to Berlin for their psychoanalytic training. They founded the Norwegian Psychoanalytic Association. The author describes the development of psychoanalysis between the two world wars, a period which was dominated by the controversy between Otto Fenichel und Wilhelm Reich, both emigrated from Berlin. The Society was split into two factions, one around Fenichel and one around Reich. In Berlin they were friends, in Oslo, however, they became bitter enemies, fighting each other. When Fenichel disagreed with Reich’s theories and practice of character analysis as an oversimplification of psychoanalysis, the Situation was made impossible for him by Reich and his followers. After a year he left Oslo for Prague. 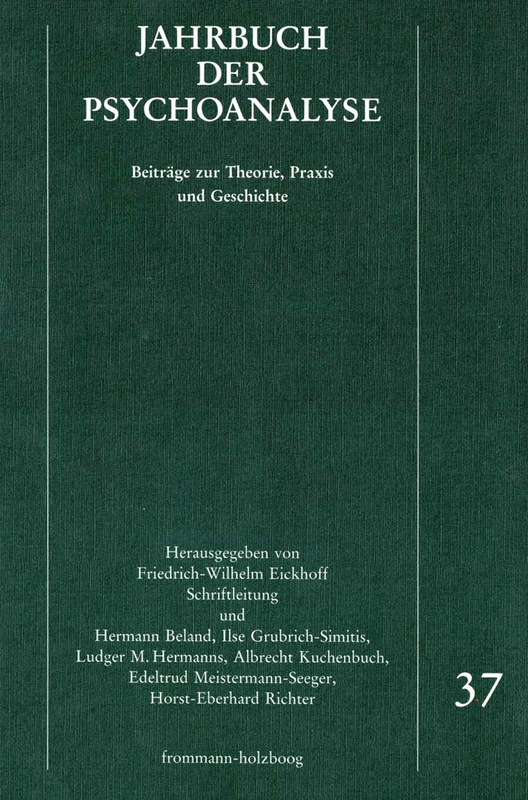 The author reviews the historical and scientific reasons for this controversy, the heated debate in academic circles due to Reich’s uncritical theories and electrobiological experiments, finally Fenichel’s engagement as a political Freudian and his «Rundbriefe» to a Marxistic group of psychoanalysts emigrated from Germany. It was an exciting epoche in our history, inspiring, but also füll of problems. For a long time to come, Reich’s shadow hovered over the Society and embittered the relations to the IPA. Der Aufsatz zeigt, daß Freud während seiner Studentenzeit durchaus an Philosophie interessiert war, daß er sich in der «Traumdeutung" auf die Phänomenologie bezog, daß er aber gegenüber einer Integration von Philosophie und Psychoanalyse skeptisch blieb, während er sich auf seine praktische Arbeit mit neurotischen Patientinnen konzentrierte. Im Unterschied dazu sah Ludwig Binswanger, der Besitzer und Leiter des Sanatoriums Bellevue in Kreuzungen und einer der bedeutendsten Psychiater seiner Zeit, sich als Psychoanalytiker, der philosophische Fragen integrieren muß. Er war nicht nur einer von Freuds wichtigsten Freunden, er behandelte neurotische und psychotische Patientinnen psychoanalytisch. Binswanger blieb stets sehr an Philosophie interessiert und sah die Phänomenologie und die dialogische Philosophie als Grundlagenwissenschaft von Psychoanalyse und Psychiatrie. Er erkannte, daß vor allem seine psychotischen Patientinnen gesünder wurden, wenn der Therapeut ihnen existentiell begegnet. Schon 1913 kritisierte er Jaspers für seine Aussage, daß Kausalität stets mit Biologie zu tun habe. Dabei benutzte er Lipps’ phänomenologische und Freuds psychoanalytische Konzepte. In einem Aufsatz von 1923 betonte Binswanger, daß Husserls Phänomenologie mit ihrer Betonung der Wesensschau tiefe Einblicke auch in schwere psychopathologien gewähren kann. Auch später blieb Binswanger stets ein Mitglied der Schweizerischen Psychoanalytischen Gesellschaft, obgleich er sich mehr und mehr für Martin Heidegger und Martin Buber interessierte. Im Unterschied zu Medard Boss und Gion Condrau benutzte Binswanger die Daseinsanalyse nicht dazu, die Psychoanalyse zu bekämpfen. Für ihn blieb sie Grundlagenwissenschaft wie Weiterentwicklung der Psychoanalyse. Dies führte schließlich zum Bruch mit Heidegger. - In den fünfziger Jahren lobte Binswanger die Psychoanalyse der Schizophrenie, wie sie von Frieda Fromm-Reichmann, Karl Landauer, Harry Stack Sullivan und Gustav Bally entwickelt wurde, da sie das erfülle, wofür er, Binswanger stets gekämpft habe: eine verantwortungsvolle und existentielle Begegnung mit dem psychotischen Patienten.